As the notes for this CD pertinently remind us, the chamber cantatas of Alessandro Scarlatti represent a quite staggering achievement. It is not only the sheer number – some 800 in all – that overwhelm the imagination, but also, and more importantly, the extraordinarily high musical quality found in such a high proportion of them. Notwithstanding the success of the modern early music revival in unearthing so much forgotten treasure, only a relatively small number of Scarlatti’s cantatas have so far been recorded. 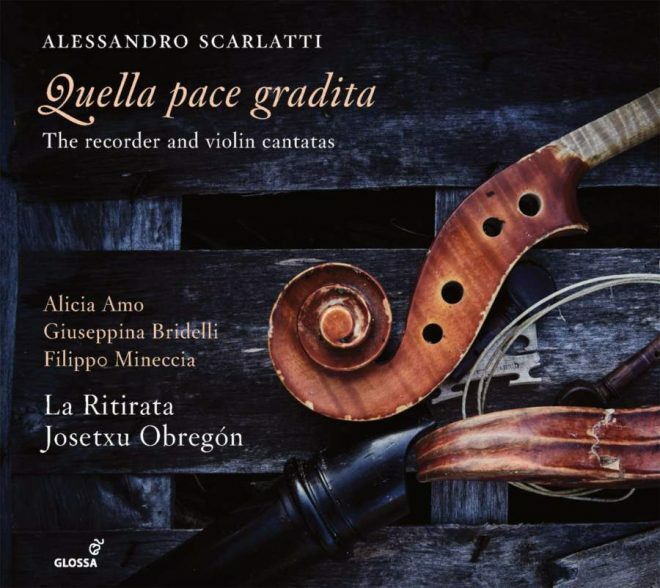 Of the five on the present disc, only one, Quella pace gradita, has been previously recorded (by Nancy Argenta). The works have in common their instrumentation, a rare combination of violins and recorders in addition to the usual continuo. All conform to the subject matter of the overwhelming majority of chamber cantatas, that of the lives and loves of the shepherds and shepherdesses that inhabit an idealised Arcadian world. Thus the first on the CD, E perché non seguite, o pastorelle, for mezzo, two violins, two recorders and continuo, speaks in the course of its three brief da capo arias and alternating recitative of woodland streams and flowery banks unable to provide solace to the absent Chloris. Not surprisingly the presence of recorders is employed to evoke mimetic images of birdsong, in the case of the enchanting single-movement Sconsolato rusignolo for soprano and strings the ‘disconsolate nightingale’, whose role is played by a flautino, while in the final aria of Quella pace gradita a turtledove provides consolation ‘where the forest is most beautiful’. The imagery of the wildness of nature is perhaps most potently evoked in the wonderful Filen, mio caro for alto, recorder, two violins and continuo, where the shepherdess Phyllis reassures her lover that mountains, rocks, streams and trees will all echo the sound of her love. Perhaps only in Tu sei quella, che al nome, a lover’s complaint (for alto) does the text concerning the cruelty of the loved one depart from the pastoral, at times being more than a little reminiscent of the poetry of medieval courtly love. The recitative in all these cantatas testifies to the high regard in which Scarlatti was held in this aspect of composition, while arias invariably achieve that juxtaposition of the learned and the appealing for which the composer was equally renowned. Inevitably some stand out, none more so than the exquisitely lovely ‘Chiedi pur ai monti’ (from Filen), sung with a real command of line and sustained shaping by countertenor Filippo Mineccia, though his vibrato can be a little obtrusive at times. But the overall standard of singing is very high indeed. Particularly praiseworthy is the recognition by all three singers (or perhaps credit should go to the director?) that these are chamber works, not miniature operas that need projecting into a theatre. So we hear pleasingly nuanced singing that maintains intimacy and in which there is no forcing of tone. Ornamentation might have been articulated more precisely at times and, as usual, we hear little in the way of the trill at cadences or the employment of messa di voce, though several obvious invitations are passed up. While both mezzo Giuseppina Bridelli, whose mezzo moves with admirable ease between head and chest notes, and Mineccia are a known quantity, soprano Alicia Amo was not, at least to me. I count her as a real find, the voice being one of pure vernal freshness, but of a sweet quality that is not at all ‘white’ and does not neglect nuance and colour. Throughout her attention to text and the shaping of line is exemplary, while the beautifully executed repeated note ornament at the end of the final recitative of Quella pace leaves one regretful that it was a decoration that had been virtually abandoned by the time of Scarlatti. Given the rare moments of insecure intonation in the violins, the instrumental support is excellent. The whole production is indeed a near-exemplary demonstration of how chamber cantatas should be performed.